I started using this preciousness over 3 years ago, based on a recommendation from a stylist who came into the coffee shop I worked at. 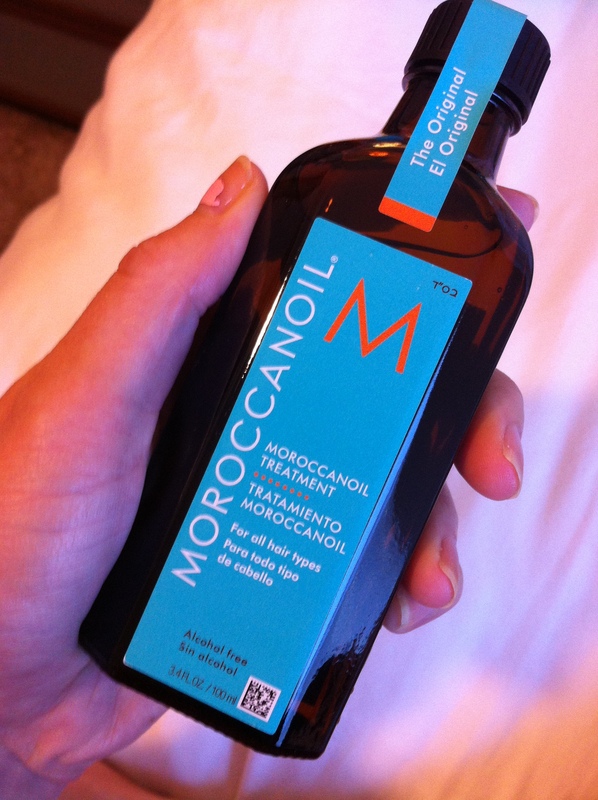 She had long, GORGEOUS locks and said she owed much of her mane’s success to Moroccan Oil. So, as a poor barista I walked down to the salon and forked over the $25 for a .85 oz bottle. Weeks later, the state of my tired, broken hair had improved ions and I was also completely addicted to the smell of the stuff. Like liquid diamonds, I treated it as such. 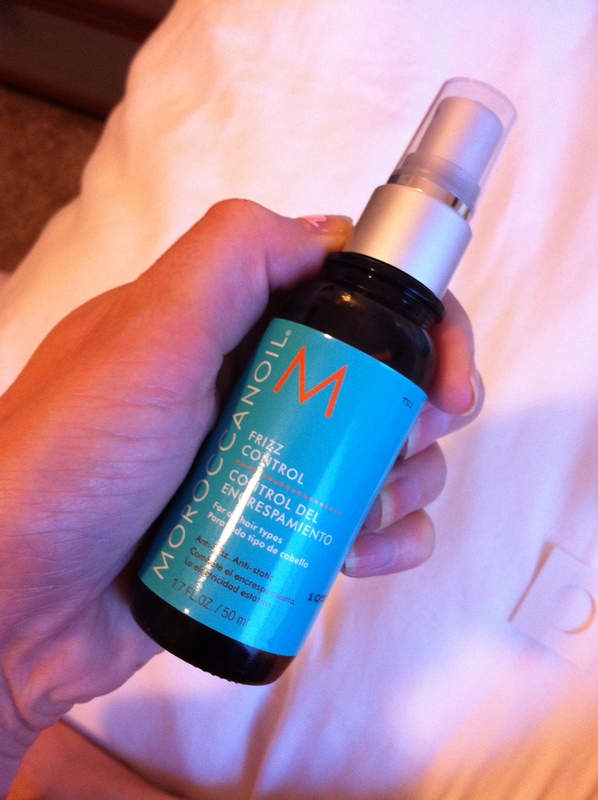 Savored every drop until the bottle was empty and off to the salon I’d go, happily exchanging my hard-earned tips for not even an ounce of this oil I quickly realized, I could not live without. Like Lassie, Moroccan Oil has remained a tried and true, dependable, and loyal friend. There for me when other products failed. A shoulder to cry on after bad highlight jobs, split ends and one too many bottles of crappy shampoo. Recently, sister Amy gifted me this set made in heaven. Three blissful products in LARGE sizes just for me. I am truly blessed. Here are the goods! 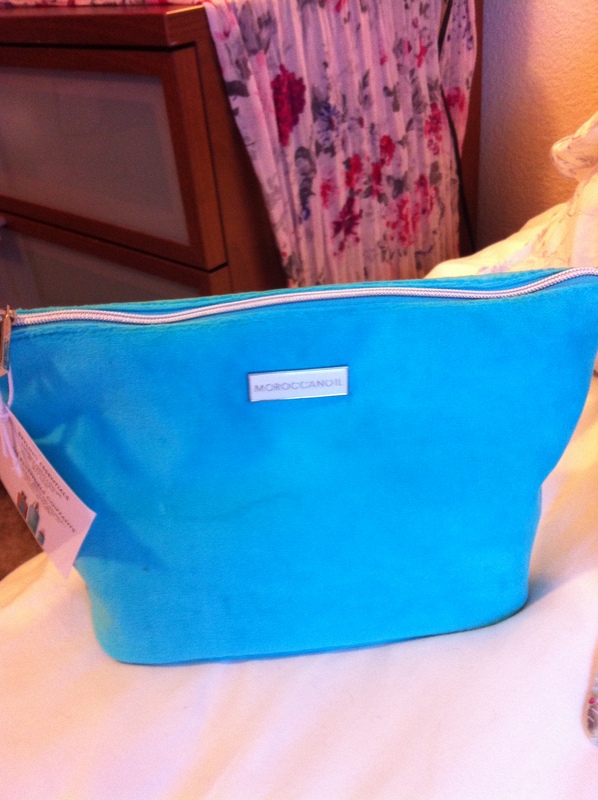 When just the color of the bag makes me giggle like a school girl, YOU KNOW the stuff inside is worthy of heroic introduction. Of the three, I must admit I am the least excited about this, only because frizz isn’t something I suffer with. Perhaps I can bring ‘er on humid vacay? Cannot WAIT to try this stuff you guys. 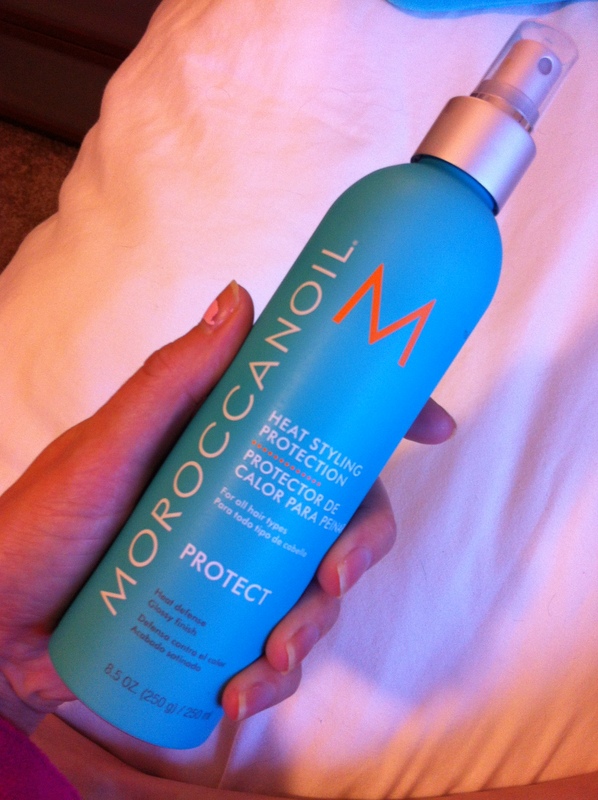 A Moroccan Oil heat protectant? You had me at Moroccan. Annnnnd the money shot. This is what I have used and loved these past years but in a, get ready for it– 3.4 ounce sized bottle of righteousness. The majesty will be unleashed very soon, as the last 1/4 of my mini bottle is slowly dissipating. Perhaps I’ll throw a party when I delve into this perfectly mastered bottle? I can see it now! Turquoise and orange streamers, maybe a firework or two? And of course, the All-American Chocolate Cake from Costco. But that my friends, is another post ;). Nice! I love your writing style, your blog is one of the few that actually make me laugh… Out loud… At my office when I should be doing work. Hahaha. Anyways, it’s funny that you’re not excited about the frizz control, that’s what I would be most excited about, haha, opposites. Then again, it’s ridiculously humid where I live now. Yay! Awesome gift! I need this too !!! 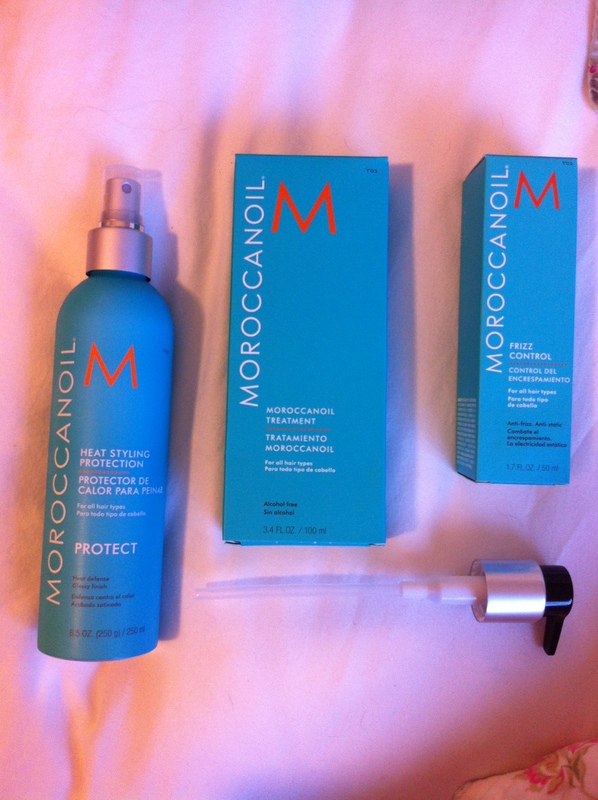 I have always wanted to try Moroccon oil.. but instead have stuck to Kerastase! May be when my elixir ultime gets over ill indulge in this one! I need to know more about Kerastase. My Nordstrom Rack carries it but I am confused at all the bottles. You should do a post about it! Oh thanks for suggesting that Natalie! 😀 Your wish is my command! Looks like some amazing hair goodness! And I could seriously go for some costco cake right now. COSTCO cake is the best. Breakfast, lunch and dinner YES.